Summary: Conceived in love and possibility, Bonaventure Arrow didn't make a peep when he was born, and the doctor nearly took him for dead. No one knows that Bonaventure's silence is filled with resonance—a miraculous gift of rarified hearing that encompasses the Universe of Every Single Sound. Growing up in the big house on Christopher Street in Bayou Cymbaline, Bonaventure can hear flowers grow, a thousand shades of blue, and the miniature tempests that rage inside raindrops. He can also hear the gentle voice of his father, William Arrow, shot dead before Bonaventure was born by a mysterious stranger known only as the Wanderer. 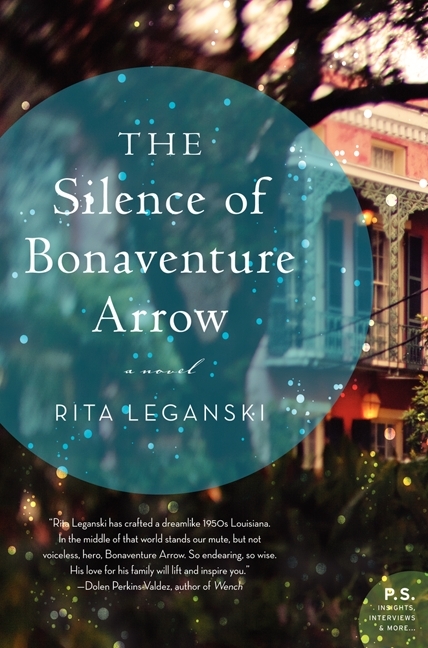 I can pretty much assure you that I wouldn't ever have picked up THE SILENCE OF BONAVENTURE ARROW by Rita Leganski if I weren't a member of the She Reads network. I am usually not one for magical realism, but I decided to give it a try since I did commit to reading the She Reads monthly selection. At first, I was pretty certain that this book would be a chore for me to read since I had a hard time getting into the story; however, I relaxed and allowed myself to get caught up in Bonaventure's life. And I actually ended up enjoying this novel quite a bit. THE SILENCE OF BONAVENTURE ARROW is definitely a unique novel. When Bonaventure Arrow was born, he was eerily quiet. In fact, Bonaventure was unable to make a peep as a baby or a youngster, but he was given a beautiful gift in return -- the ability to hear every single sound in the universe... and that includes the voice of his dead father. Bonaventure's silence ends up being a gift to his loved ones. His mother, who continues to mourn the loss of her husband, and his grandmother, who can't reconcile a mysterious event from her past, find a sort of salvation through Bonaventure; and his dead father who roams the earth trying to come to terms with his own death also ends up finding grace because of his son's special gift. With the help of a Creole housekeeper who has her own set of special gifts, Bonaventure uncovers many secrets from the past and allows his family to begin the process of healing. Because THE SILENCE OF BONAVENTURE ARROW was a little outside my comfort zone, I thought it started kind of slowly. Having said that, I'm sure readers more familiar with this genre will not feel this way. And while I did take me awhile to really enjoy this story, it didn't take me any time at all to appreciate Ms. Leganski's lyrical writing style. Her prose is gorgeous and she definitely brought the characters and the Louisiana setting to life. I really feel that I could go on and on about these characters because I became very attached to them while reading this story. I absolutely adored little Bonaventure, and his immediate family members were well drawn and very complex characters too. I could almost feel the pain that Bonaventure's mom, grandmother, and father were experiencing, and it warmed my heart that Bonaventure was able to help them all heal. It really is no wonder that THE SILENCE OF BONAVENTURE ARROW was selected as a March 2013 Indie Next List Selection and that it received a starred review from Library Journal. The story and the characters are quite intriguing, and I appreciated how the book explored voodoo, superstition, and various types of healing. But I suspect what made this book extra-special were the messages about love and listening. Through Bonaventure, the reader can examine the difference between hearing and listening and how wonderful a gift listening can be. Naturally, THE SILENCE OF BONAVENTURE ARROW would make an interesting book club selection. There is a reading guide available with twelve thought-provoking questions. I've probably been over this already, but some of the themes you might want to discuss include hearing vs. listening, salvation, healing, redemption, forgiveness, acceptance, love, isolation, religion, and faith. I think fans of magical realism are going to adore THE SILENCE OF BONAVENTURE ARROW. And I highly suspect that a few "non" fans of magical realism (ahem like me!) just might find that they think this is a pretty special book too. This sounds pretty good to me. I wasn't aware of it, but I will definitely look for it now! As you know, this wasn't my favorite - I'll be posting about it soon.